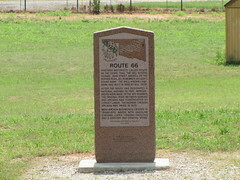 Route 66 Whether motorists called Route 66 the Ozark Trail, the Will Rogers Highway, Main Street America or the Mother Road, all remember Arcadia's Round Barn, The well - known land-mark was built in 1898 by W.H. Odor. After the Route was designated a national Highway in 1926, improvements were made to the 1917 roadbed. The original road between Edmond and Arcadia was constructed by convict labor. The highway through Arcadia was paved in 1929. Many Arcadia business catered to travelers needs with gasoline station, cafes, lodging facilities and a grocery and general store. Quapaw, Vinita, Claremore, Tulsa,Sapulpa,Bristow, Stroud, Candler, Arcadia, Oklahoma City, Bethany, El Reno, Bridgeport, Weatherford, Clinton, Elk City, and Texola. 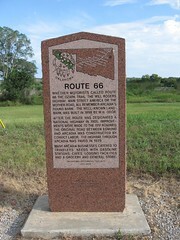 Route 66, Arcadia, Oklahoma. 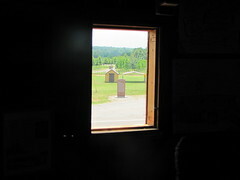 Across the street from the Round Barn.